Annual HOA meeting for Forest Lakes single family homes is February 5, 2019 at 6:00 at the Clubhouse. The pool will is open May 1 st through September 30th. Thank you to everyone that participated in the 2017 poll. Based on the results the policies in place were in line with the goal of the owners. Clubhouse rental- (127 Homeowners responded to this poll, this includes Forest Lakes Homes and the Retreat Homeowners). 42% did not want clubhouse rentals on the weekends. 32% would like to see clubhouse rentals on the weekends. 26% did not have an opinion. Basket Ball Hoops- (111 Homeowners responded to this poll). 44% did not want to see basketball hoops permitted. 31% did wish to see basketball hoops permitted. 25% did not have an opinion. Yard Sales- (111 Homeowners responded to this poll). 41% wanted two yard sales per year permitted. 28% wanted four yard sales per year permitted. 17% did not have an opinion. 14% did not want yard sales permitted at all. Community Card Game "Hand and Foot"
Everyone is welcome to join in for a fun night. Please RSVP to Linda Battle if you would like to attend for planning purposes. The pool is open from May 1st to September 30th. We have placed a small bookcase in the main room of the Clubouse. It is stocked with books we have read and enjoyed (or not!) and are ready to pass on to other readers in the community. Feel free to keep or return a book, or add one or more of your own. Let’s keep the books circulating! Please sign the Guest Book so we know who’s interested. Join the neighborhood and learn or teach how to knit sew, crochet,paitn, scrapbook, stamp, make jewerly, photography, cards, etc Craft parties are help once a month at 6:30 p..
Meet the third Friday of each month. Statewide, there have been a number of questions regarding lawns that have failed to green-up this spring. Multiple factors have contributed to green-up issues, including disease. The environmental conditions of this spring have been conducive for disease development on all the grasses species used across Georgia (e.g. bermudagrass, centipedegrass, St. Augustinegrass, zoysiagrass and tall fescue). 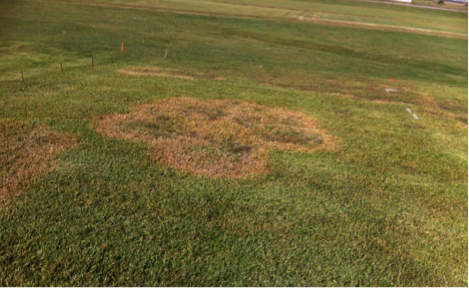 Generally, turfgrass diseases are the exception and not the rule. Disease management includes proper turf care, or agronomics, that promote a healthy lawn. The use of fungicides should be last resort to reducing disease problems on the average lawn. Dollar Spot is a fungal disease of most turfgrass species used for home lawns across Georgia. It is favored by warm, humid weather and is typically more severe on nitrogen-deficient turf. When active, mycelium (white thread- or web-like growth) can be seen in early morning hours, particularly when dew is present. Dollar spot fungi are ubiquitous and can lay dormant in plant tissue and soil until environmental conditions become favorable for plant infection. It causes grass leaves to die in small, tan or bleached, patches (1 to 2 inches in diameter). Lesions occur where the disease infects the leaf, typically causing dieback from the grass tip. 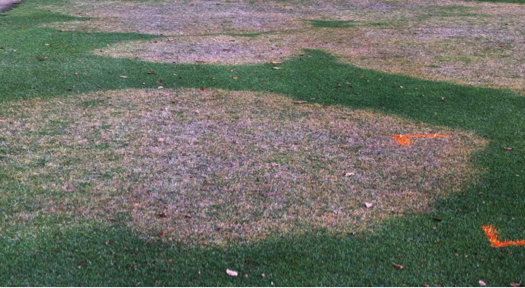 Large Patch is another fungal disease of all the turfgrass species used for home lawns across Georgia. It is most common when warm-season grasses transition to active growth in the spring and approach dormancy in the fall, but can be identified throughout the summer. It too lays dormant in decaying plant tissue and soil. Large patch appears as irregular rings, or patches, of tan to brown foliage. Patches may be several feet in diameter and can develop rapidly when the disease is active. Favorable conditions for large patch include warm, humid weather. Excess soil moisture, extended leaf wetness, and high levels of nitrogen increase large patch severity. Use the best adapted turfgrass species for to your area (right plant, right place). Reduce soil compaction, thereby improving turfgrass root development. Set your mower to the proper mowing height and maintain the one-third mowing rule. When disease is active, increase the mowing height (e.g. go from 1.0 inch to 1.5 inches). Fertilize according to recommendations for your turfgrass species. Not all grasses need the same amount of nitrogen. Don’t apply nitrogen containing fertilizers before soil temperatures at the 4-inch depth are consistently 65ᵒ F and rising. Use the recommended level of nitrogen, particularly in the late spring and early summer. Correct drainage issues to reduce soil and canopy wetness. Practice proper irrigation management (1.0-inch / week during the growing season). Irrigate turf early in the morning, allowing the canopy to dry throughout the day and decreasing the time for infection to occur. Avoid thatch build-up (an accumulation of decaying plant material at the soil surface). Use fungicides for disease control only when necessary – always read and follow label directions. In early spring and late fall preventative fungicides can help prevent infection of dollar spot and large patch. To see the latest turfgrass research and technology for your lawn, consider attending the UGA Turfgrass Research Field Day at the UGA Griffin Campus on August 6 – download program and registration information from www.GeorgiaTurf.com. Homeowners and professionals are welcome! Follow us for up-to-the-minute sustainable landscape tips: www.twitter.com/UGAExtHOA.For more information contact your Chatham County Extension Office at 912-652-7981 or visit www.caes.uga/extension/chatham.